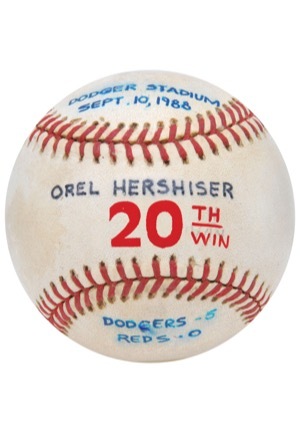 This baseball comes to us directly from Orel Hershiser. 1988 was a historic year for Orel as he won the Cy Young, set a new consecutive scoreless innings record at 59 and was named World Series MVP after the Dodgers defeated the Oakland A’s in the 1988 Fall Classic. 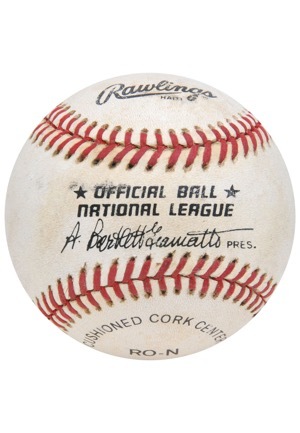 This baseball was used during his 20th win of that historic season of 1988. ONL Giamatti baseball with “DODGER STADIUM SEPT. 10, 1988” on the north panel in blue ink. On the sweet spot is “OREL HERSHISER 20TH WIN” in black and red. Below on the south panel is “DODGERS 5 REDS 0”. The ball shows nice use with scuffing and dirt spotting. Accompanied by a LOA from Orel Hershiser.